Luke Skywalker Isn't Kylo Ren, Right? The latest and final Star Wars: The Force Awakens trailer debuted last night during Monday Night Football on ESPN. (And if for some reason you still haven’t seen it, it dropped online right after.) There’s still a great deal we haven’t seen from J.J. Abrams’ seventh installment of the Star Wars franchise, so expectations were high. But even then, Lucasfilm kept a few major reveals out of the new footage, the most notable being Luke Skywalker. We still haven’t seen an official look at Mark Hamill’s return as the Jedi Knight. We’ve seen Carrie Fisher as Princess Leia, Harrison Ford as Han Solo, and even Peter Mayhew as Chewbacca. For some reason, Abrams and co. are holding off on the Skywalker front, which has caused a massive fan theory to form about his true identity that seems so — shall we say — out there that it couldn’t possibly be true…right? The theory is that Kylo Ren, the new "totally not a Sith" bad guy with the cross-guard lightsaber, is actually Skywalker, who’s now fighting for the Dark Side. I know, it sounds a little crazy, but fans have been finding evidence to support it — the least of which is that it sounds like something Abrams would do. There’s a reason why Lucasfilm still hasn’t revealed Skywalker to the public. My guess is that doing so would reveal a massive spoiler too big to drop at this point. All we’ve heard from the character so far is his voice narrating the original Force Awakens trailer, saying, "The Force is strong in my family…" Other than that, we know Hamill was spotted filming scenes on the remote Skellig Michael Island, and viewers have just assumed that was his bionic hand in the trailer patting R2-D2. Consequently, there’s probably a reason we haven’t seen Adam Driver’s face in the trailers or promotional materials, even though he was announced as Kylo Ren. Before we get into the nitty gritty of this theory, here’s why it can't be true. Again, Driver was announced as Kylo Ren and he hit up Comic-Con to reveal some photos of his character in the film. Vanity Fair also revealed his face outside of the Ren mask in their massive photo spread. Furthermore, his voice is clearly heard in the new trailer coming out of this character as he says, "Nothing will stand in our way. I will finish what you started," presumably addressing the scorched helmet of Darth Vader. 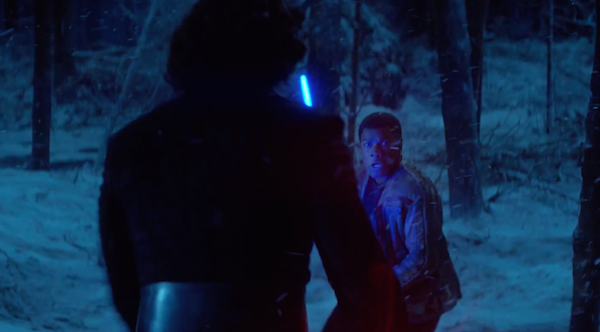 In the scene where Kylo Ren ignites his lightsaber in the wintry woods to face Finn, we only see his back, but it’s clearly Driver wielding that weapon. Now, here’s why this theory has become as loud as it is on social media. Let’s go back to the poster — Hamill’s name appears second in the list of acting credits, and yet he’s nowhere to be seen on the poster. This led some to believe that he’s actually on the poster, and given how high his name appears in the credits, one would think his character would appear as one of the larger rendered floating heads. Ren, along with Rey and Finn, is one of the largest. Some have also speculated that the name Kylo Ren is merely a title, but that’s not entirely true. As we learned in an interview with Abrams in Entertainment Weekly, "Ren" is the title, which refers to a mysterious organization called The Knights of Ren. "Kylo" is the unique signifier, a name Kylo Ren chose for himself for some equally mysterious reason. That said, we don’t know really anything about The Knights of Ren, and who’s to say Skywalker didn’t become a part of it? My clothes are made of camel hair, I eat locust & wild honey, I'm out here in the wilderness shouting, "Kylo Ren is Luke Skywalker!" "Kylo Ren = Luke Skywalker" is one of those theories that sounds so insane that you start questioning your sanity. It is fun to think about and argue, but at the end of the day, all the evidence is coincidental, and it actually makes more sense that Skywalker is Skywalker. That said, we are dealing with Abrams, so expect some classic twist to throw us all through a loop.